The house is in the town of Sayulita on one of the highest spots yet a very short walk to the center of town. Sayulita is in the state of Nayarit near the larger city of Puerto Vallata. 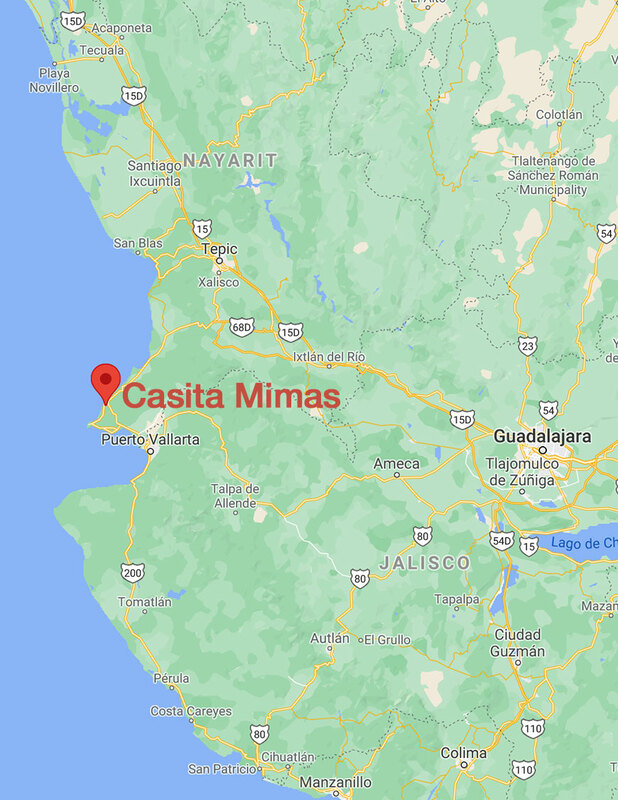 Casita Mimas is located in the town of Sayulita high above one of its most scenic spots, overlooking the beautiful Pacific coastline of Mexico’s Riviera Nayarit. This unique vacation home is available all year round for weekly rentals from Saturday to Saturday and can be rented by itself or together with adjacent Casa Dos Chicos and Casa Saturno for a large party. The house is a very romantic and spacious retreat immersed in its own lush garden with a private custom Hot tub and features a beautifully decorated bedroom with private bath, full kitchen and living room, great views. Casita Mimas has an open air feel with a modern and minimal design that also pays homage to the local design traditions. The house and its grounds provide a unique retreat high above the town and the sea but is also located a short walk to all the local charm, great restaurants and nightlife Sayulita has to offer as well as the many beautiful beaches. Our personalized concierge service will fulfill any requests and help you book airport transportation, golf carts, yoga classes, massages, a private cook and more. The house is available on a weekly basis from Saturday to Saturday year round, and for long weekends in low & shoulder seasons. Please submit your reservation request and we will confirm availability and price. Rates are inclusive of daily cleaning, all utilities, Wi-Fi, bed linens, all towels including pool towels, soaps, detergents, bathroom amenities. Rates listed are for occupancy of 3 max. To reserve we require a signed contract and payment of 50% of rental. Balance due will be owed 4 weeks before rental begins. A refundable security deposit of $500 is due before rental begins. Payments can be made with credit card or money transfer. For 2 or more consecutive weeks we offer a 5% discount on total. Renter is responsible for maintaning the house, the grounds and the pool in good condition and should report any problems on site to owner or owner’s agent. A few recommended itineraries & places to visit nearby. Puerto Vallarta (30 min. ): a large city with a colonial center & cathedral, great shopping, restaurants, bars & board walk along the sea. San Pancho (10 min. ): A sleepy mexican town nearby with a great beach, lagoons for bird watching, great sunsets on the ocean. San Blas (90 min. ): a unique natural reserve with lagoons and mangoves full of wildlife. Boat tours avaiable for crocodile and bird watching. We would be happy to help you make your stay at Casa Mimas very special and to organize any of the services listed above as well as others not listed. Owners and on site manager can assist you with all your needs and wishes. Fees apply in the case of wedding planning and based on the scope of the event and size of the party.